Unusual applications require unique solutions. 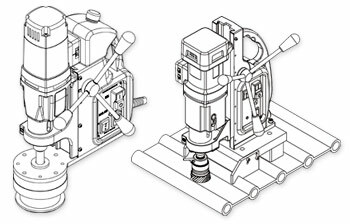 We can help you build custom drills for a wide variety of applications. With our considerable experience building custom drills, our engineers can assist you to create machines that can drill on uneven surfaces, in various directions, and more. Multi-axis positioning; holes to 3-1/8" dia. ; tap to 1-3/16"
Automatic feed; drill to 4-1/16" dia. ; tap to 1-1/8" dia.